Guys. Let’s get serious for a minute. You know that album you listen to with the windows down and sunroof open, winter weather be damned? Yeah? Hit the eject button and switch to Heyrocco’s Dark Summer for a few. This four-song EP, a selection of tunes from a future full-length album (as I heard it told), will satisfy that need deep inside for infectious melodies, intelligent lyrics, and driving rhythms without an ounce of sugar. The opening tune, a new-love, blushing-boyfriend confection titled Elsewhere, is anything but bubblegum, but you’ll dance along like a high schooler at the prom. Where Nathan, Chris, and Tanner could have settled for common time and common lyrics, they instead give us something a bit off-kilter. The seven-four time signature during the verses and story of a romantic gesture wrapped in teenage rebellion (with the potential for double entendre here and there) will make you long for happier times when being grounded was the worst thing that ever happened to you. And then you’ll hit repeat. This leads into Coma (Love It All), a powerful message about teenage anxiety and feeling uncomfortable in your own skin—a sentiment we all remember clearly, no matter how old we get. The guys twist a bouncing beat—courtesy of drummer Tanner’s inimitable skill—and lilting voice into something darker, with veiled lyrics about bullying, fear, and hiding our true selves behind a mask of smiles just to survive. Consider such words as I crawl in someone else’s skin/and make believe it’s mine/everyone loves the boy that can’t ever say no and you’ll understand why the guys go ahead and call their self-created genre dark pop. And then you’ll hit repeat. The album’s one ballad, Slowdance, carries all the wistfulness and wishfulness of a first broken heart. Lead singer Nathan will tear you to shreds with his ethereal vocals as he laments lost love. Everyone remembers the first breakup, brought back with stunning clarity when they sing Come back home/don’t you want to/Come and crawl/through my window/There’s a slow dance waiting there for you. Though subdued and dreamy, there is nothing simple about the song—not even the memories it elicits. And then you’ll hit repeat. Wrapping up this stellar EP is Sleepsong, which is a misleading title. There is nothing sleepy about this relentless tune, which features bassist Chris in some pretty impressive acrobatics. Jumping right back into youthful anxiety and paranoia, the lyrics here give a stronger message: Every time you open up your mouth all I’m thinking about/how I wish I had a razor I could cut it out/Then I wouldn’t have to hear you when I’m trying to dream. In spite of the dark words and deeper revelation, this is the one you’ll crank up. This is the one you’ll skip to when you’re dying to blow off some steam. This is the one you won’t get out of your head when you’re trying to sleep. And then you’ll hit repeat. I won’t mince words. I love this EP. I love this EP. I’ve been a fan of the band for a while now, and I have a hard time believing they could do anything wrong. The truly scary thing—and it’s not really scary at all—is that these guys are still too young to drink. They sing so eloquently about real teen issues because they’re not long out of high school themselves. 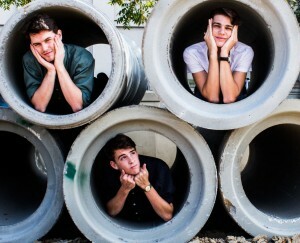 They’re clever, talented, and grow by leaps and bounds with every EP and LP they release. In a few more years, they’ll be downright dangerous, and I sometimes feel like I’m the only one who knows this. If you want to check them out and see if you agree, you can find them on their website, Facebook, Twitter, and Bandcamp. If you want to buy Dark Summer for yourself, you’ll have to catch them live and pay Nathan, Chris, or Tanner personally.